The Washington Post recently published a story on Egypt's growing black market, which is rapidly replacing the "official" economy. WP: - Egypt’s rapidly expanding black market for fuel — and for foodstuffs, other commodities and U.S. dollars — may be the most tangible illustration of just how badly the economy of this vast Arab nation is failing, two years after the fall of Hosni Mubarak. The prices of most basic goods, like fuel and flour, have been fixed for decades, with Egypt pouring roughly a quarter of its GDP into a bloated and deeply inefficient national subsidy system each year. As foreign reserves run dangerously low, access to fuel is becoming particularly critical. To prevent a complete economic collapse in Egypt, Libya has stepped in to give support until the long-awaited IMF loan is put in place. Libya is in effect providing an interest-free oil loan for a year as a stop-gap measure. Reuters: - Libya will soon start shipping oil to neighboring Egypt on soft credit terms, two senior Libyan officials said, as Cairo struggles to pay for energy imports and avoid fuel shortages. The officials told Reuters that Tripoli would supply Cairo with $1.2 billion worth of crude at world prices but on interest free credit for a year, with the first cargo expected to arrive next month. Egypt's officials continue to emphasize that the IMF loan deal is just around the corner. 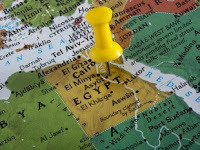 Egypt's Official Press: - The Governor of the Central Bank of Egypt (CBE) said that measures required by the International Monetary Fund (IMF) for Egypt to obtain a loan are normal and followed all over the world. During an interview with CBC satellite channel on Saturday 27/4/2013, Hisham Ramez said that an agreement with the IMF to get the loan is about to be concluded. The IMF loan has other dimensions because it opens the door for borrowing from other bodies, Ramez said. But that could be wishful thinking. Egypt just suffered a major setback, as its key negotiator quit today. Reuters: - A key Egyptian negotiator with the International Monetary Fund said on Sunday he has resigned as first deputy finance minister, in a potential blow to Cairo's prospects of an early IMF deal. Hany Kadry Dimian has been the crucial point man in Egypt's protracted and so far fruitless negotiations to obtain a $4.8 billion loan needed to help combat a severe economic crisis. Kadry gave no explanation for his decision to quit, first reported on the Egyptian dissident Rebel Economy blog, saying he would say more on Tuesday. A senior European diplomat said his departure was not a good omen for Egypt's hopes of wrapping up a deal on the long delayed IMF loan next month, as the government has said it aims to do. There has been speculation that Qatar will step in to help Egypt with a $3bn loan, but so far that support hasn't materialized. Furthermore, many Egyptians are uneasy with Qatar and view it as meddling in the nation's internal affairs. According to official sources in Egypt, foreign reserves now stand at $13.4 billion, while foreign debt is at $38.8 billion (up 13% from previous year). As summer approaches, the risks of violent civil unrest rise sharply. This year Ramadan will be in July, the hottest month of the year. Power outages are expected to be quite frequent and shortages of bread and fuel could become an issue. With Syria becoming the recent focus of mass media, Egypt's issues have not been widely covered. Yet in the near future, Egypt's woes present a major source of uncertainty in the Middle East.